A couple nights ago Karl requested that I use the ripe bananas we had sitting on the counter to make a banana bread for him to take to work and share with his coworkers. 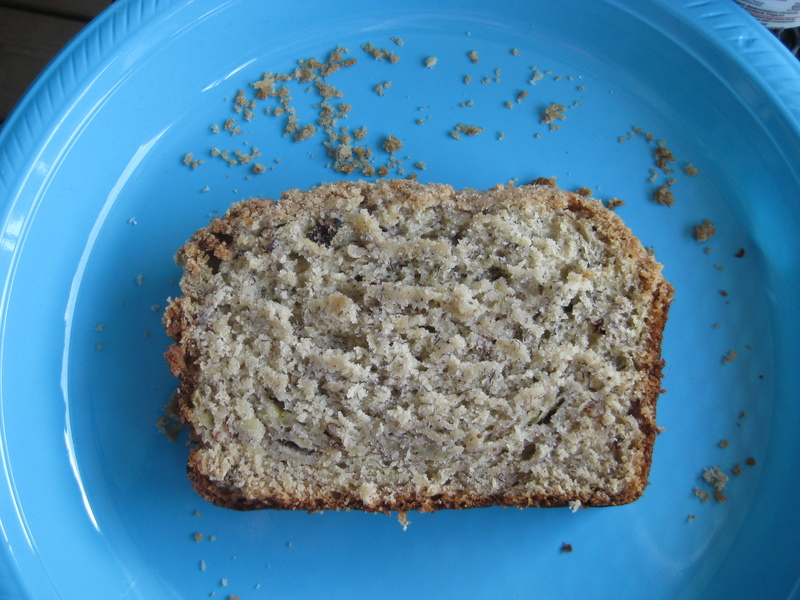 I have made other banana breads before, but none of the recipes were that good. I looked around online, but when it came down to it I just decided to use the recipe in my pink Better Homes and Gardens New Cookbook. The recipe was simple, and I made up some of their recipe for streusel topping and put that on top. I popped that thing in the oven and tried to be patient while it baked. 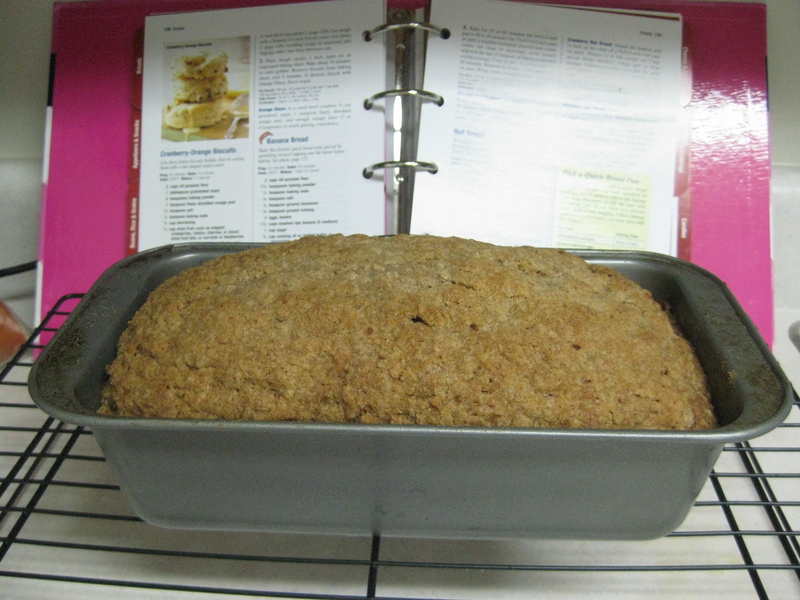 It turned out really pretty, but I would recommend putting some wax paper in the bottom of the loaf pan before pouring in the batter so that the bread is easy to just pull out instead of flipping it over (you lose a little of the streusel when you do that). It was torture to smell this wonderful bread baking and not be able to try a piece! That always makes me nervous too. I really like to try what I bake before I send it to work. I don’t want people thinking I can’t cook! Luckily I have an amazinghusband, and when he came home to see me for lunch (it was my day off), he brought me my own piece! The beautiful slice Karl brought home for me! Preheat oven to 350. Grease your loaf pan (and I would recommend placing wax paper over the sides so that you can easily remove the loaf from the pan after baking). In a large bowl combine the flour, baking powder, baking soda, salt, and cinnamon. Make a well in the flower mixture then set it aside. 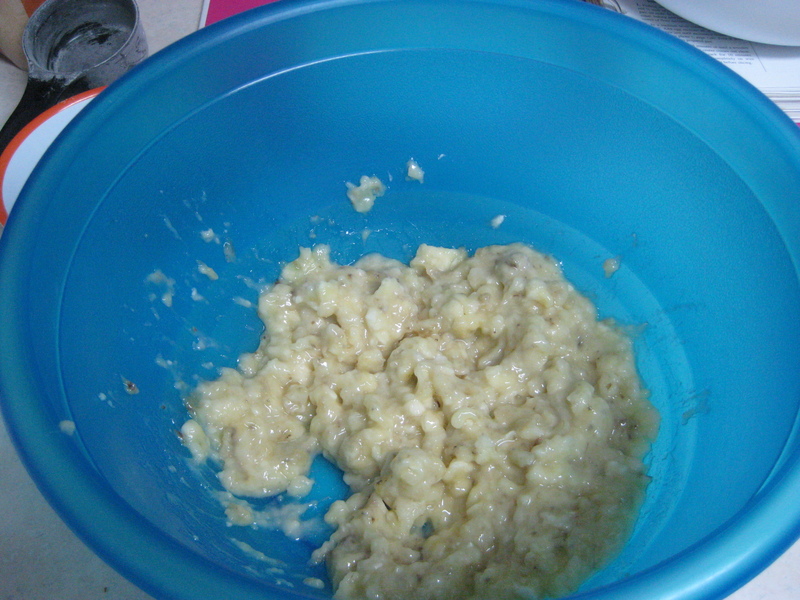 In a smaller bowl combine the eggs, banana, sugar, and butter. 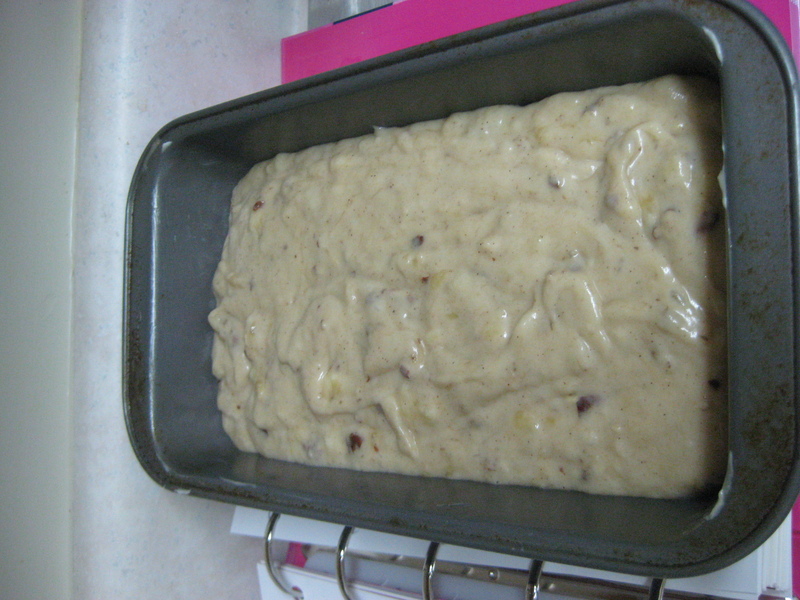 Pour the batter into the prepared pan. If desired, sprinkle a streusel topping (see recipe below) over the batter and press into the batter a little bit. Coil in the pan on a wire rack for 10 minutes then remove from the pan and cool completely on the rack. When it is cool wrap and store it over night before slicing. In a small bowl combine 1/4 cup packed brown sugar and 3 Tbsp. all-purpose flour. Using a pastry blender, cut in 2 tbsp butter (I actually used 4 – the more butter the better!) 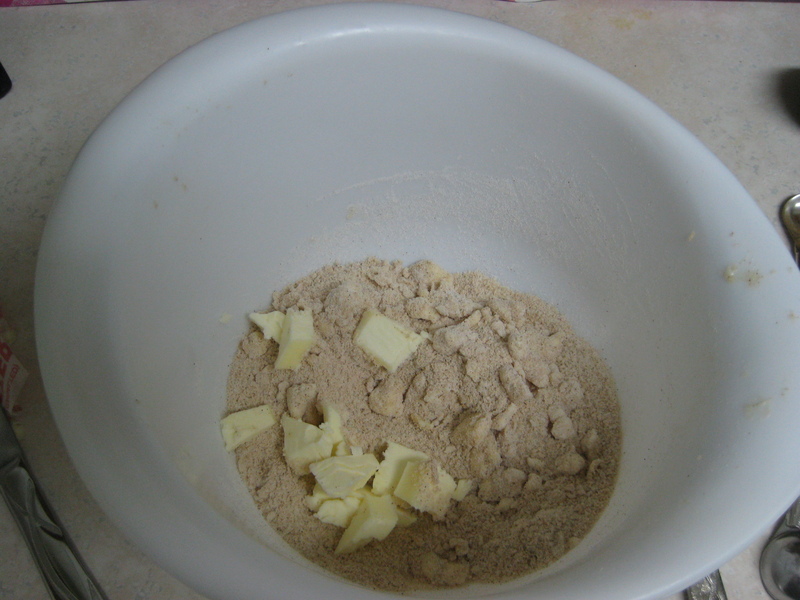 until the mixture resembles course crumbs.